Meanwhile, Tánaiste Eamon Gilmore has met with the Indian Ambassador to Ireland, Debashish Chakravarti, to discuss the death of Savita Halappanavar. SINN FÉIN IS to table a motion in the Dáil next week calling for the Government to immediately legislate for the 1992 judgement of the Supreme Court in the X Case. The motion states that Dáil Éireann “extends its deepest sympathy to the family of Savita Halappanavar and recognises that news of her death in such tragic and traumatic circumstances has caused distress to people throughout the country and beyond”. It also “resolves to await the outcome of the ongoing inquiries into all aspects of this tragedy” and “acknowledges that the Oireachtas must legislate to give effect to the 1992 judgment of the Supreme Court (the ‘X Case’)”. Finally, the party calls on the Government to immediately publish the report of the expert group and immediately introduce legislation to give effect to the 1992 judgment of the Supreme Court in the ‘X Case’, to protect pregnant women where their lives are in real danger and to give legal certainty to medical professionals”. The debate will take place on Tuesday and Wednesday, with the Dáil voting on the motion on Wednesday at 9pm. Meanwhile, RTÉ notes that the family of Savita are to be consulted before the HSE terms of reference for the inquiry into her death are finalised. Minister for Health Dr James Reilly said that a “balance needs to be struck” between getting the answers urgently and taking care to get to the truth. Taoiseach Enda Kenny told reporters today that abortion has to be dealt with “rationally”, said RTÉ. 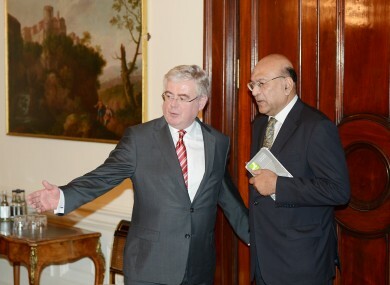 He also confirmed that Tanaiste Eamon Gilmore was to meet with the Indian Ambassador. The meeting took place in the last few hours. Also today, Amnesty International has said that the abortion issue must be clarified by the Irish government. It said that Ireland must ensure that its domestic law and policy on access to abortion is in line with international human rights law. The organisation has written to Irish Minister for Health James Reilly and is concerned the tragic case of Savita Halappanavar “illustrates a gap in Irish law and policy on the most basic human rights level – that is a woman’s right to access abortion where her life is at risk”. Email “Sinn Féin to table Dáil motion calling for legislation for X Case”. Feedback on “Sinn Féin to table Dáil motion calling for legislation for X Case”.